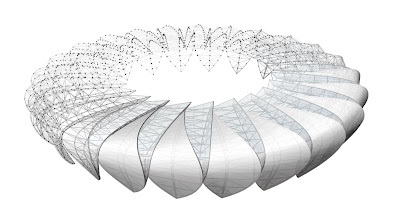 This March at the ACADIA 2011 regional conference, I will be giving a presentation on the Hangzhou Tennis Center: A Case Study in Integrated Parametric Design. The Tennis Center is a new component of the larger Hangzhou Sports Park which I have blogged about in previous posts. My lecture will describe, in detail, the process of assembling the parametric model of the exterior shell which includes systems for form finding, rationalization, detailed cladding, simulation and coordination. 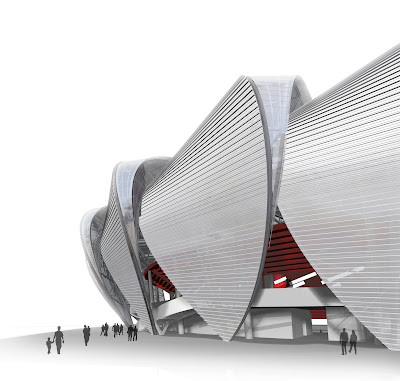 The project builds on the processes implemented in the main stadium project and extends them to achieve new levels of efficiency, detail, and rigor in a large-scale, international application.